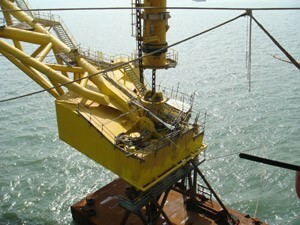 Tower Mooring and Loading System for the Peng Lai FPSO in the Bohai Bay oil field. After reconstruction for deployment to the Bohai Bay Phase II Development Project offshore from People’s Republic of China, the Peng Lai FPSO required a new tower mooring and loading system to begin taking on up to 40,000 barrels of oil per day. Timberland Equipment was contracted by Bluewater Energy Services BV to design, manufacture and commission the vessel’s two chain jacks and 114mm mooring installation chains including a hydraulic power unit and control system. The nominal pulling capacity of the chain jack was 350 Te, with a stopper ultimate capacity of chain breaking strength (1050 Te). The greatest obstacle was a design parameter requiring each chain jack to be installed inside a vertical tube that was only 2.0 meters in diameter. All hoses, control cables and main chain also required accessibility inside this tight space. Maintenance accessibility would be nearly impossible after initial installation, so reliability in the field was super-critical.